A rich body moisturizer that improves the look and feel of even the driest skin, leaving a radiant glow. 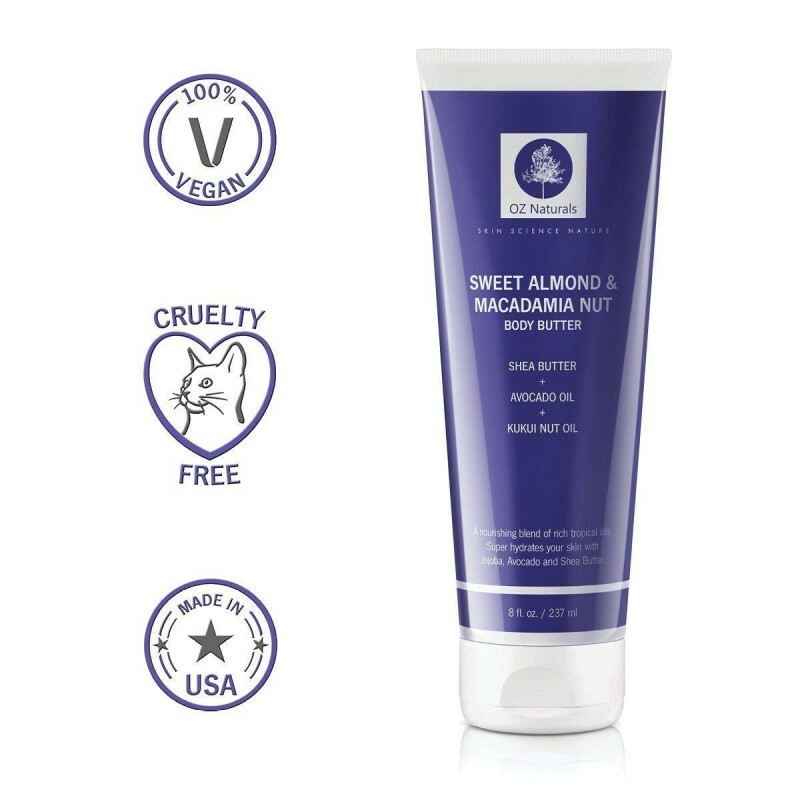 Macadamia nut oil nourishes dry, chapped skin with Omega 7 fatty acids. 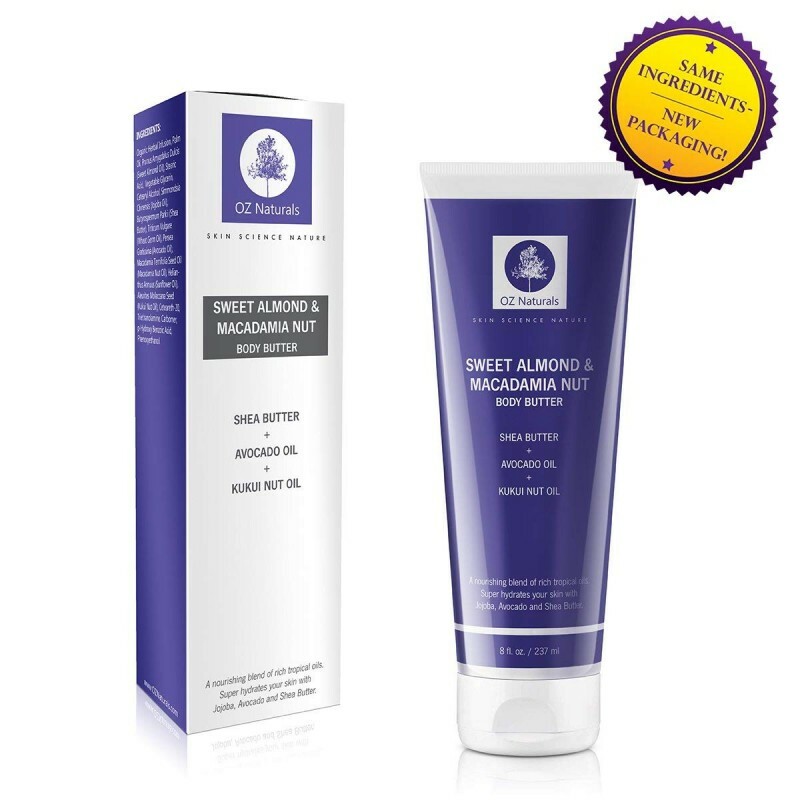 The Vitamins A, B1, B2, and B6 which are found in Sweet Almond oil help soothe and restore parched skin. Just as with facial skincare, a body moisturizer that includes beneficial ingredients can go beyond just providing moisture, and actually improve the overall health and look of your skin. This nourishing and hydrating formula was created to provide a healthy, dewy, summer skin look, and is packed with nourishing ingredients to hydrate skin even during harsh, dry winter months. 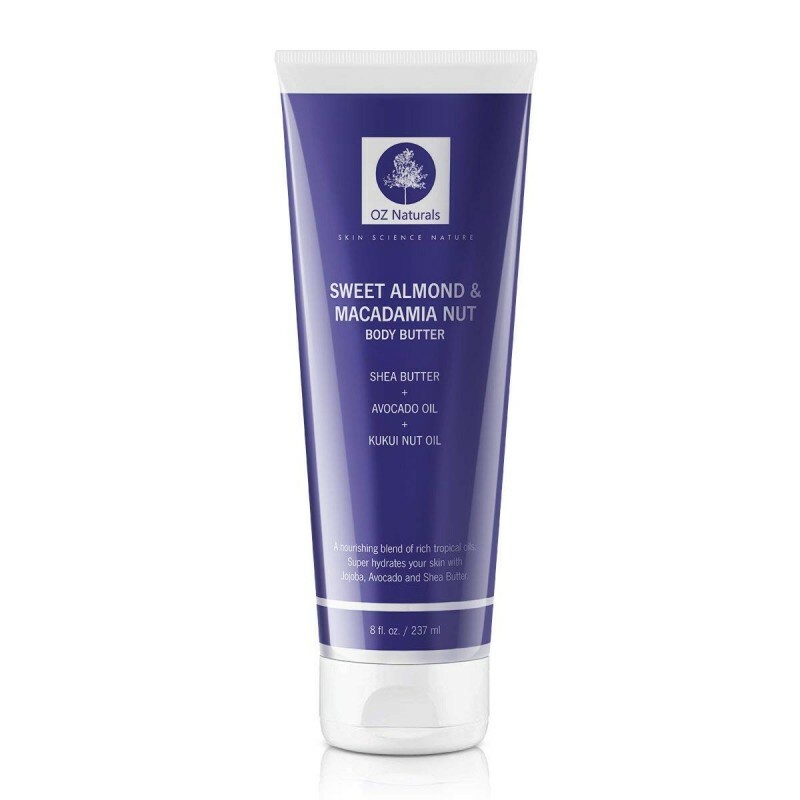 It contains sweet almond and macadamia nut oils for the richest, silkiest, moisture replenishing, all-over body moisturizer available. If you want your skin to have that summer-sheen glow all year around, this is your body butter. 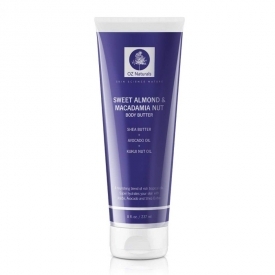 This luxurious macadamia nut lotion renews skin and fights free radicals for a younger healthy glowing look. Nourishing and hydrating, it can also be used on the face for very dry skin types. Use daily. To get the most out of your OZNaturals Body Butter, apply liberally after showering or bathing, while your skin is still damp. This allows the humectants and emollients in the moisturizer to trap and seal in moisture for long-lasting protection and comfort. Shea Butter - Nature’s moisture miracle, rich in vitamins and beneficial fatty acids. Avocado Oil – Combines beneficial antioxidants with skin-replenishing fatty acids for deep moisturization. Kukui Nut Oil – A tropical oil with luxurious moisturizing and skin-soothing benefits. AQUA, DICAPRYLYL CARBONATE, COCO-CAPRYLATE, COCO-CAPRYLATE/CAPRATE, CAPRYLIC/CAPRIC TRIGLYCERIDE, BUTYROSPERMUM PARKII BUTTER, THEOBROMA CACAO (COCOA) SEED BUTTER, CETEARYL ALCOHOL, 1,3 PROPANEDIOL, GLYCERIN, SODIUM MAGNESIUM SILICATE & XANTHAN GUM & CITRIC ACID, CHAMOMILLA RECUTITA (MATRICARIA) EXTRACT, CAMELLIA SINENSIS LEAF EXTRACT, ALGUE EXTRACT, PERSEA GRATISSIMA (AVOCADO) OIL, PRUNUS AMYGDALUS DULCIS (SWEET ALMOND) OIL, MACADAMIA TERNIFOLIA (MACADAMIA NUT) SEED OIL, SIMMONDSIA CHINENSIS (JOJOBA) SEED OIL, ALEURITES MOLUCCANA (KUKUI) SEED OIL, P ANISIC ACID, PHENYLPROPANOL, PROPANEDIOL, CAPRYLYL GLYCOL , TOCOPHEROL, PANISIC ACID, HAEMATOCOCCUS PLUVIALIS EXTRACT, ASTAXANTHIN. Individual results can and will vary. OZNaturals Skincare products are purely cosmetic in nature and do not claim to cure/treat/prevent any skin related disorders. If you are allergic to any ingredients listed, are under medical treatment or on any medications for your skin, please consult with your physician prior to use. I would happily buy this one again as it felt lovely on my skin. A very nice natural body moisturiser that is rich and very moisturising for all skin types. "I would happily buy this one again as it felt lovely on my skin."